How Will Consumers Use Faster Internet Speeds? This week saw an exciting announcement about the experimental deployment of DOCSIS 3.1 in limited markets in the United States, including Philadelphia, Atlanta, and parts of northern California, which will bring gigabit-per-second Internet speeds to many homes over the existing cable infrastructure. The potential for gigabit speeds over the existing cable networks bring hope that more consumers will ultimately enjoy much higher-speed Internet connectivity both in the United States and elsewhere. This development is also a pointed response to the not-so-implicit pressure from the Federal Communications Commission to deploy higher-speed Internet connectivity, which includes other developments such as the redefinition of broadband to a downstream throughput rate of 25 megabits per second, up from a previous (and somewhat laughable) definition of 4 Mbps; many commissioners have also stated their intentions to raise the threshold for the definition of a broadband network to a downstream throughput of 100 Mbps, as a further indication that ISPs will see increasing pressure for higher speed links to home networks. Yet, the National Cable and Telecommunications Association has also claimed in an FCC filing that such speeds are far more than a “typical” broadband user would require. These developments and posturing beg the question: How will consumers change their behavior in response to faster downstream throughput from their Internet service providers? Ph.D. student Sarthak Grover, postdoc Roya Ensafi, and I set out to study this question with a cohort of about 6,000 Comcast subscribers in Salt Lake City, Utah, from October through December 2014. The study involved what is called a randomized controlled trial, an experimental method commonly used in scientific experiments where a group of users is randomly divided into a control group (whose user experience no change in conditions) and a treatment group (whose users are subject to a change in conditions). Assuming the cohort is large enough and represents a cross-section of the demographic of interest, and that the users for the treatment group are selected at random, it is possible to observe differences between the two groups’ outcomes and conclude how the treatment affects the outcome. “Moderate” users tend to adjust their behavior more than the “heavy” users. We expected that subscribers who downloaded the most data in the 250 Mbps service tier would be the ones causing the largest difference in mean demand between the two groups of users (previous studies have observed this phenomenon, and we do observe this behavior for the most aggressive users). To our surprise, however, the median subscribers in the two groups exhibited much more significant differences in traffic demand, particularly at peak times. Notably, the 40% of subscribers with lowest peak demands more than double their daily peak traffic demand in response to service-tier upgrades (i.e., in the treatment group). 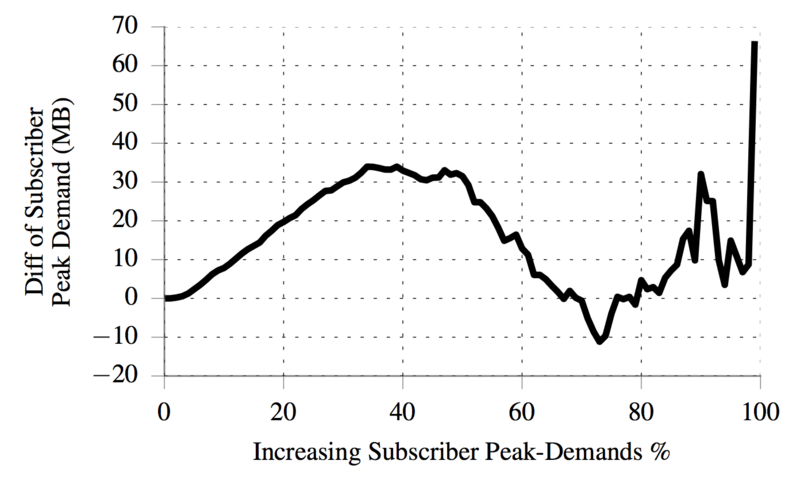 With the exception of the most aggressive peak-time subscribers, the subscribers who are below the 40th percentile in terms of peak demands increase their peak demand more than users who initially had higher peak demands. This result suggests a surprising trend: it’s not the aggressive data hogs who account for most of the increased use in response to faster speeds, but rather the “typical” Internet user, who tends to use the Internet more as a result of the faster speeds. Our dataset does not contain application information, so it is difficult to say what, exactly is responsible for the higher data usage of the median user. Yet, the result uncovers an oft-forgotten phenomena of faster links: even existing applications that do not need to “max out” the link capacity (e.g., Web browsing, and even most video streaming) can benefit from a higher capacity link, simply because they will see better performance overall (e.g., faster load times and more resilience to packet loss, particularly when multiple parallel connections are in use). It might just be that the typical user is using the Internet more with the faster connection simply because the experience is better, not because they’re interested in filling the link to capacity (at least not yet!). Users may use faster speeds for shorter periods of time, not always during “prime time”. There has been much ado about prime-time video streaming usage, and we most certainly see those effects in our data. To our surprise, the average usage per subscriber during prime-time hours was roughly the same between the treatment and control groups, yet outside of prime time, the difference in usage was much more pronounced between the two groups, with average usage per subscriber in the treatment group exhibiting 25% more usage than that in the control group for non-prime-time weekday hours. We also observe that the peak-to-mean ratios for usage in the treatment group are significantly higher than they are in the control group, indicating that users with faster speeds may periodically (and for short times) take advantage of the significantly higher speeds, even though they are not sustaining a high rate that exhausts the higher capacity. These results are interesting for last-mile Internet service providers because they suggest that the speeds at the edge may not currently be the limiting factor for user traffic demand. Specifically, the changes in peak traffic outside of prime-time hours also suggest that even the (relatively) lower-speed connections (e.g., 105 Mbps) may be sufficient to satisfy the demands of users during prime-time hours. Of course, the constraints on prime-time demand (much of which is largely streaming) likely result from other factors, including both available content and perhaps the well-known phenomena of congestion in the middle of the network, rather than in the last mile. All of this points to the increasing importance of resolving the performance issues that we see as a result of interconnection. In the best case, faster Internet service moves the bottleneck from the last mile to elsewhere in the network (e.g., interconnection points, long-haul transit links); but, in reality, it seems that the bottlenecks are already there, and we should focus on mitigating those points of congestion. Further reading and study. You’ll be able to read more about our study in the following paper: A Case Study of Traffic Demand Response to Broadband Service-Plan Upgrades. S. Grover, R. Ensafi, N. Feamster. Passive and Active Measurement Conference (PAM). Heraklion, Crete, Greece. March 2016. (We will post an update when the final paper is published in early 2016.) There is plenty of room for follow-up work, of course; notably, the data we had access to did not have information about application usage, and only reflected byte-level usage at fifteen-minute intervals. Future studies could (and should) continue to study the effects of higher-speed links by exploring how the usage of specific applications (e.g., streaming video, file sharing, Web browsing) changes in response to higher downstream throughput. Is There a Future for Net Neutrality after Verizon v. FCC? In a decision that was widely predicted by those who have been following the case, the Court of Appeals for the D.C. Circuit has invalidated the FCC’s Open Internet Rules (so-called net neutrality regulations), which imposed non-discrimination and anti-blocking requirements on broadband Internet access providers. The rules were challenged by Verizon as soon as they were enacted in 2010. The court held that, given the FCC’s past (and never reversed or modified) regulatory choice to classify broadband providers under the Telecommunications Act of 1996 as “information services” rather than “telecommunications services,” it cannot now impose on them common carrier obligations that apply under the statute only to services classified as telecommunications. Verizon argued in the case that the Open Internet Rules were not common carrier regulations, but the court didn’t buy it. For the past year, I’ve been serving on the FCC’s Open Internet Advisory Committee (OIAC), and chairing its mobile broadband working group. The OIAC just completed its first annual report (available here). The report gives an overview of the past year of work from four working groups (economic impacts, mobile broadband, specialized services, and transparency). I highly recommend anyone interested in Open Internet issues take a look.